According to a report from dpa, Qualcomm is leveraging two patents, one for each venue, in its new action against Apple. The intellectual property at play covers battery efficiency technology and originates from the same batch of six patents leveraged against Apple in Qualcomm's U.S. International Trade Commission complaint, reports FOSS Patents. Specifically, the chipmaker is claiming infringement of U.S. Patent No. 8,698,558 for a "Low-voltage power-efficient envelope tracker" and No. 9,608,675 for a "Power tracker for multiple transmit signals sent simultaneously." Unlike the ITC complaint, which targets iPhones that integrate wireless modems manufactured by Intel, the pair of German lawsuits seek an end to imports of all iPhone models. All current iPhone models sold in Europe rely on Intel components. Apple began using Intel modems with iPhone 7, with the chipmaker winning about 30 percent of all orders for the handset. More recently, rumors suggest Apple will further diversify its supply chain and incorporate Intel chips in 50 percent of all iPhones made in 2017. Interestingly, Qualcomm last week filed a motion in San Diego requesting that Apple not sue or initiate "additional duplicative" actions against in foreign jurisdictions while the U.S. actions are being decided, FOSS Patents notes. The filing, and Qualcomm's Wednesday complaints in Germany, suggest the company views general lawsuits and patent infringement cases differently. Speaking at a technology conference earlier this week, Qualcomm CEO Steve Mollenkopf said the company's fight with Apple is about intellectual property licensing and contractual agreements, adding that he expects the battle to end in an out of court settlement. In relation to the ongoing legal kerfuffle, Qualcomm today announced a 40 percent drop in profits for its third fiscal quarter of 2017 as the company failed to garner revenue generated by patent royalties from Apple, reports The Wall Street Journal. The firm's patent licensing division took a huge hit, with revenue falling to $1.17 billion, down 42 percent year-over-year. Qualcomm earned $865 million in profits on revenue of $5.37 billion, also down 11 percent from the same period last year. Qualcomm's legal troubles are only intensifying. On Tuesday, Apple manufacturers Foxconn, Compal, Wistron and Pegatron filed an antitrust suit against the chipmaker claiming violation of two sections of the Sherman Act. 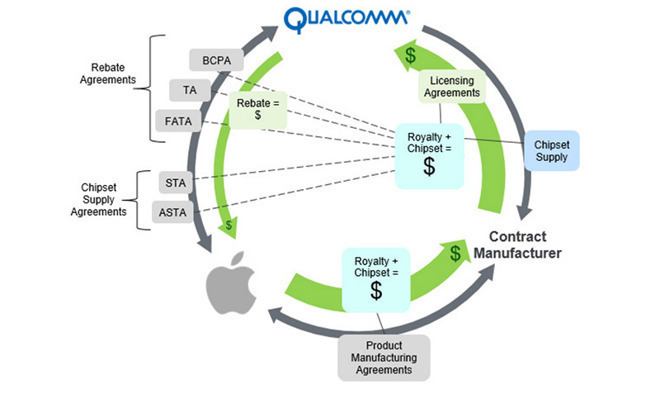 The filing, backed by Apple, is a counterclaim to a lawsuit Qualcomm lodged in May seeking to force Apple contract manufacturers to maintain royalty payments during the legal dispute. The suppliers began to underpay or withhold royalty payments in the first quarter.